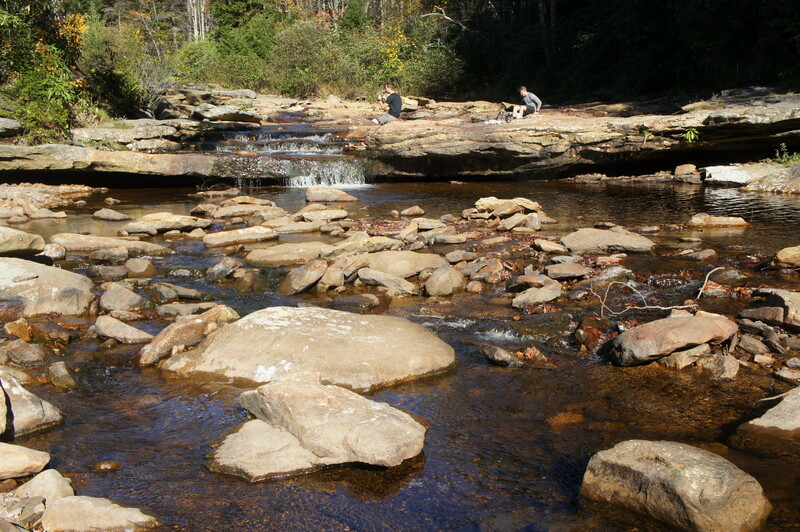 Situated on a high plateau in the heart of West Virginia’s Appalachian country, Dolly Sods Wilderness in Monongahela National Forest offers alpine-like meadows and sweeping vistas that are virtually unparalleled in the mid-Atlantic. Once one of the state’s best kept secrets, Dolly Sods is now a popular backpacking destination and boasts a maze of interlocking trails. 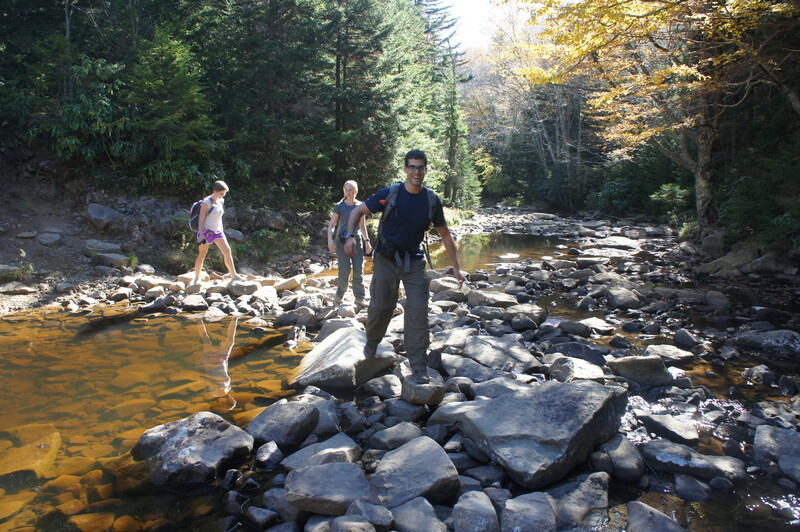 While not as popular as the stunning Dolly Sods North hike, the ecological diversity and differentiated terrain of the Blackbird Knob Loop surpasses that of its northern cousin. There are a number of variations, but the route described here—best completed as a long day hike or a 2-day backpack—visits both the forks of Red Creek and the westerly views across Canaan Valley, with plenty of Dolly Sods’ famed meadows in between. A large wooden kiosk on the west side of the road marks the start of the Blackbird Knob Trail. The first minute of the hike covers wooden boardwalk, which weaves through low scrub bearing northwest. Soon the boardwalk gives way to dirt, and the path darts in and out of spruce groves. 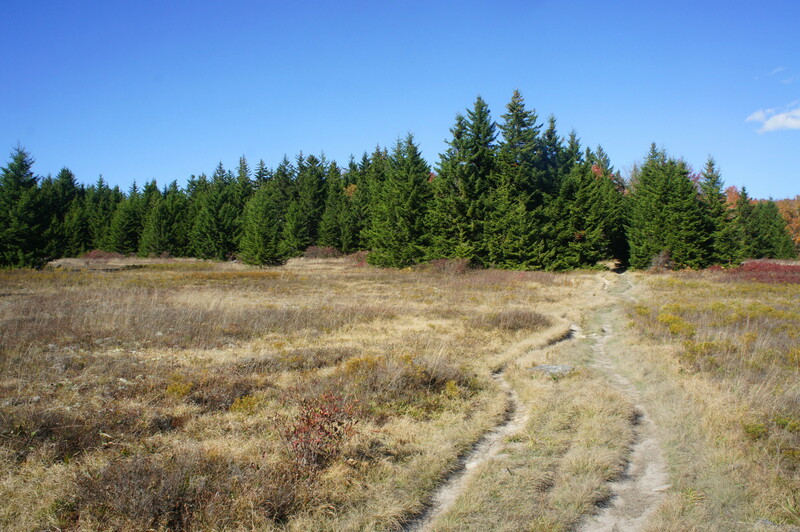 (Note: Red spruce are a relatively rare find south of Pennsylvania; it is Dolly Sods’ high elevation and cool temperatures that allows these spruce forests—as well as a number of other species—to proliferate.) 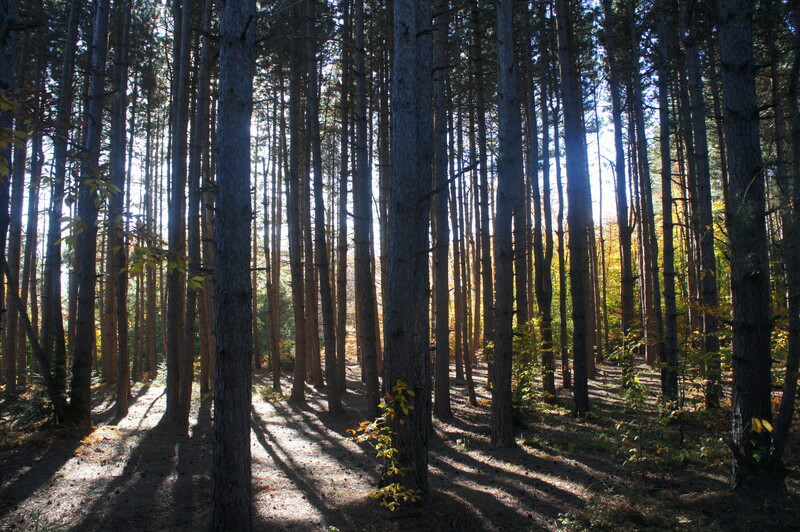 In between spruce groves are stands of deciduous trees, including oaks, maples, and hickories. Upon entering a dense forest dominated by tall hemlocks, the trail bears left and heads southwest. Shortly thereafter, views open up to the south and west over the Red Creek Basin. Like the foreground, the hillsides on the horizon are coated with a mixture of conifers and deciduous trees, a mélange of sub-Arctic terrain and classic Appalachian landscapes. Weaving amid blueberry bushes, the trail approaches a spur to a campsite with a nice view at about 7/10 mile. Now heading firmly west at a steady downhill, the Blackbird Knob Trail passes through minor meadows lined with conifers and shrubby vegetation. 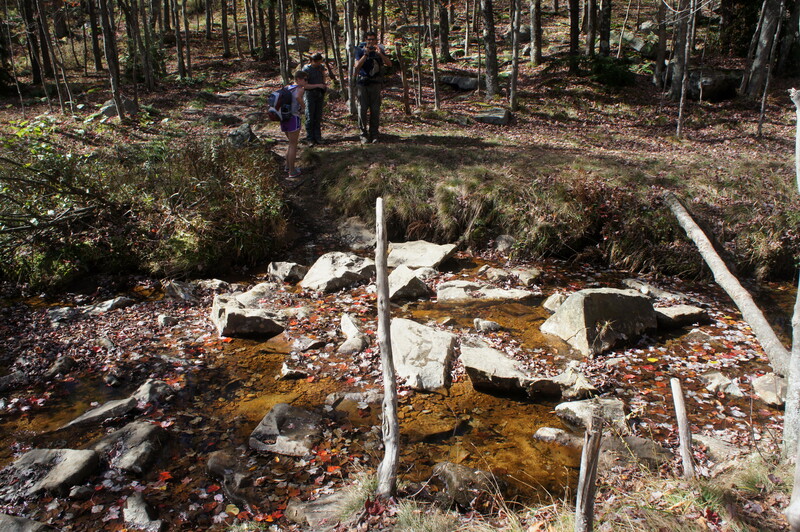 After encountering a mud pond on the right, hikers then descend to a crossing over Alder Run at 1.1 miles. The traverse is short and relatively easy, barring recent snowmelt or floods. Beyond the creek, the trail climbs a fern-dotted hillside, with views down to the left of a grassy meadow. The relatively open views end suddenly at about 1.5 miles, when the trail dives into a spruce forest and begins a gradual descent to Red Creek, which is first spotted on the right at about 1.65 miles. (Note: There is a social trail from here leading down the bank to an oxbow island with a couple of stellar campsites.) A minute later, the Blackbird Knob Trail drops steeply to a stream crossing; stepping stones offer passage over Red Creek, which is much wider and deeper than Alder Run. Beyond Red Creek, the trail climbs in earnest out of the woody ravine and emerges back out into the open at a junction with the Upper Red Creek Trail, which leads northward off to the right. Stay straight, continuing as the trail begins to skirt the slopes of its namesake peak: Blackbird Knob (3,950’). While the path does not lead to the summit, it does gain about 100 feet and enters yet another new ecosystem, this time a forest of American beech trees. From the junction, the Red Creek Trail drops sharply, and the beech forest gives way to spruce and a series of open meadows. Back in the woods, large rhododendrons appear on both sides of the trail. At about 2.8 miles, the route begins a sharp and rocky descent into the Red Creek Valley, losing about 150 feet in elevation over the course of 300 yards. The Left Fork of Red Creek appears on the right, followed quickly by a stream crossing at 3.1 miles. Just past the crossing, listen for rushing water over to the left and follow one of many social trails down to the water’s edge. This is a popular destination known as “The Forks,” where two branches of Red Creek come together. (Note: You will have crossed the right fork farther north back at 1.7 miles.) The right fork spills over a small, 5-foot waterfall into a deep pool. This is an excellent spot to stop for a snack—or to settle in to one of the many nearby campsites. Beyond The Forks, the Red Creek Trail climbs gradually to a position well above the stream below. Now 3.4 miles from the trailhead, take a sudden right on the Breathed Mountain Trail, leaving the Red Creek Valley behind. 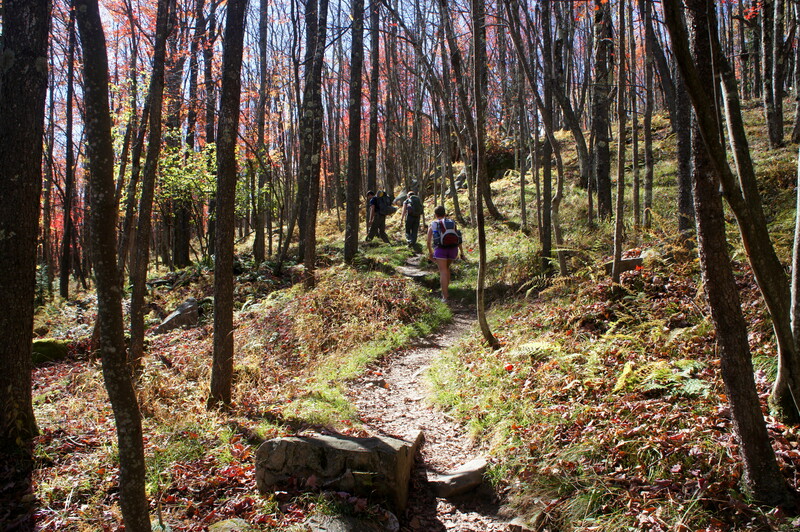 The Breathed Mountain Trail gains 200 feet in around 3/10 mile, making it the steepest climb of the hike. Once back atop the plateau, the terrain levels out and the trail traverses a sandy meadow that, when flooded, becomes a small lake. From here the route climbs gradually to surmount a small knob then drops to a brushy pass between the Stonecoal Run Valley and the upper basins of Dolly Sods. A large meadow is visible on the right. 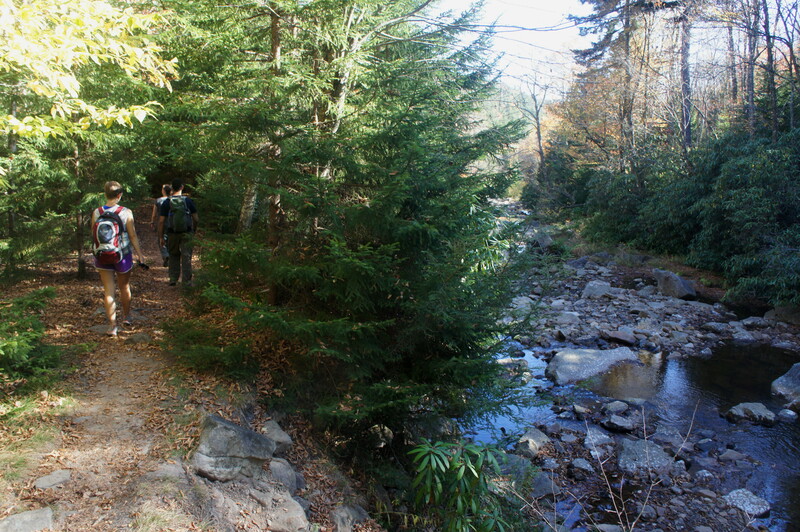 Then it is back to climbing again, as the Breathed Mountain Trail approaches the western slopes of the Allegheny Front, the high plateau where Dolly Sods is found. By now some degree of monotony has probably settled in—but it is broken soon enough by a four-way trail junction at 5.9 miles. Following an old fire road, bear right on the Blackbird Knob Trail. 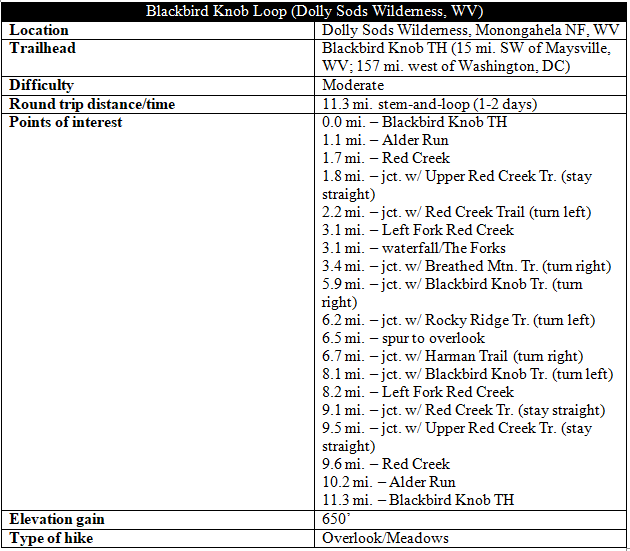 You will not be on the Blackbird Knob Trail for long, as the trail forks again after 3/10 mile. 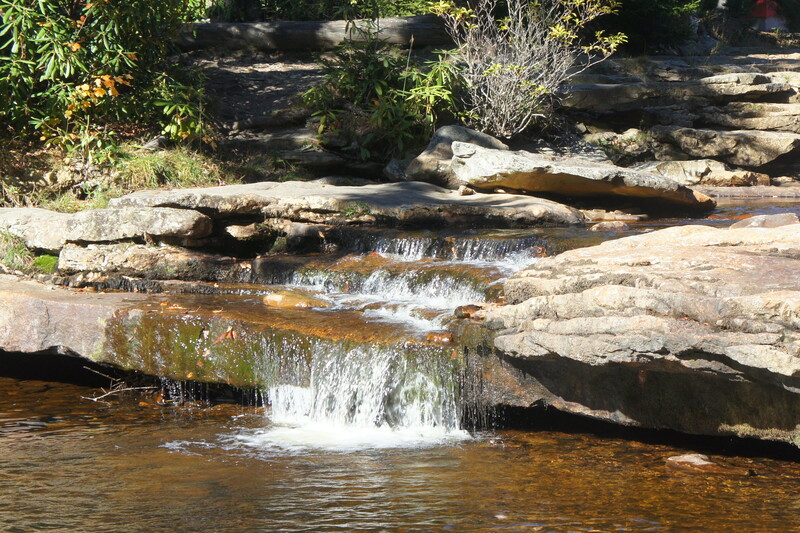 Turn left onto the Rocky Ridge Trail, arguably the best in Dolly Sods due to its splendid views of Canaan Valley. At the beginning, the vistas are shrouded by dense spruce forest, but soon the trail emerges into a clearing with views back to the south. Around 6.5 miles from the trailhead—and 3/10 mile up the Rocky Ridge Trail—look for a well-trodden social trail heading off to the left. This is the short spur to a terrific overlook, one of the highlights of the hike. 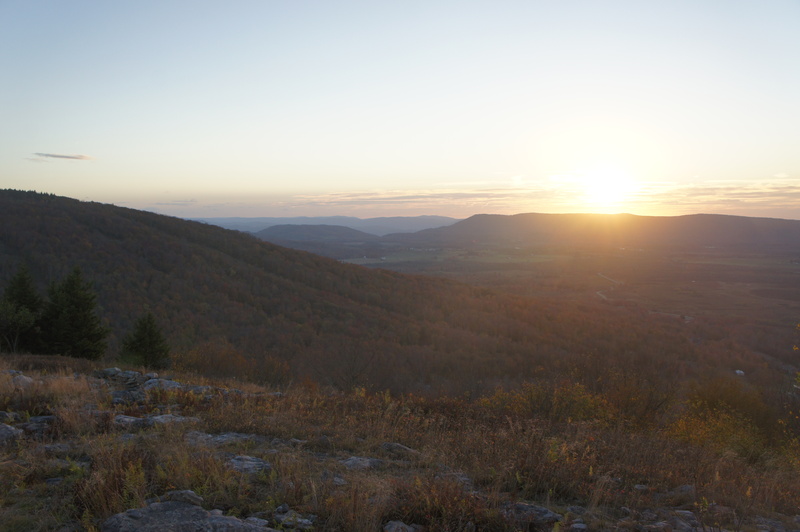 From the viewpoint, Canaan Valley unfolds in all its majestic beauty, with the heights of Canaan Mountain beyond. On the near side, the bald to the south is one of the many summits of Cabin Mountain (4,298’). Straight ahead, in the valley, are two small, man-made lakes. To the north, it comes as a surprise to see houses, high up the slopes of the mountain: prime real estate with close access to the extraordinary vistas of Canaan Valley. 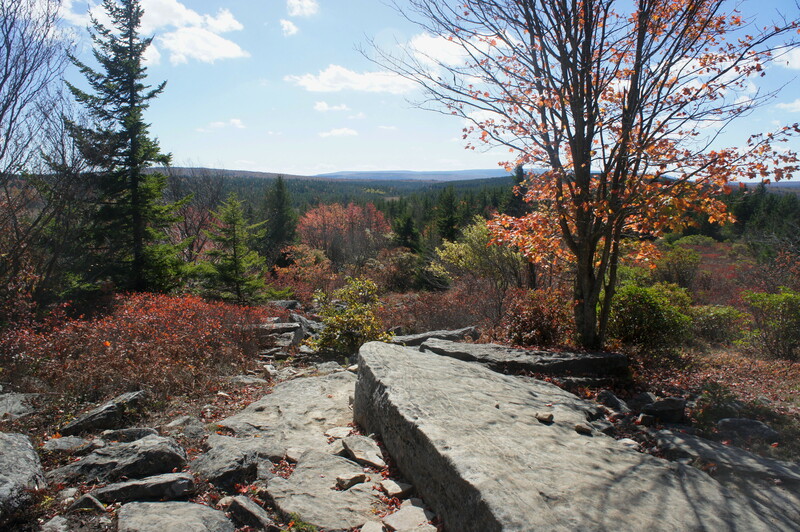 Rocky Ridge continues several miles to the north; the western end of the Dolly Sods North hike can be seen from here. To top things off, there is now a small bench at the viewpoint, a perfect spot to observe the sunset. Once you’ve soaked it all in, head back down the spur trail and bear left on the Rocky Ridge Trail as it continues north. After 2/10 mile, bear right on the Harman Trail, which heads back across the Sods to the east. Most of this 1.4-mile trail covers high ground with low scrub, offering views of Blackbird Knob and the valley carved by the Left Fork. At 8.1 miles, the path rejoins the Blackbird Knob Trail; bear left. Shortly after the junction, the Blackbird Knob Trail crosses the Left Fork of Red Creek as it weaves through a beautiful meadow. 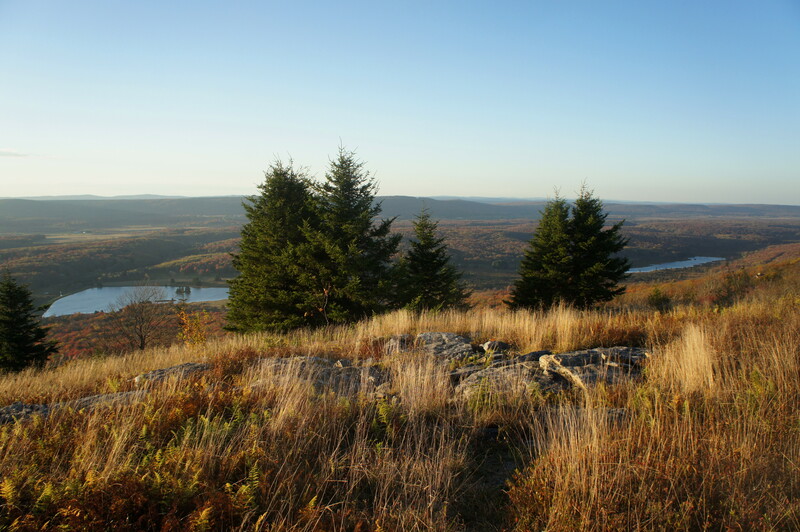 From the east bank, the path runs gradually uphill as it climbs the slopes of Blackbird Knob; sporadic breaks in the trees offer views south over the Red Creek Basin. 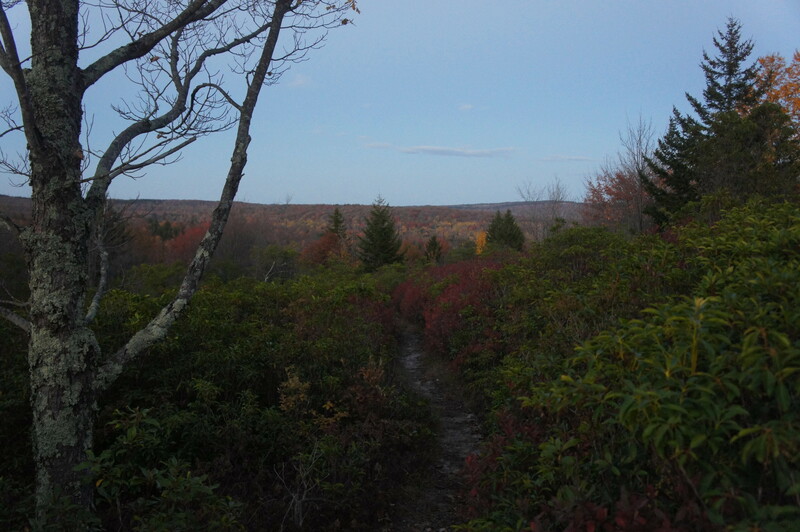 Just before the end of the loop, the trail skirts a sloping meadow, with the knob summit to the north. Finally, at 9.1 miles, it’s back to the junction with the Red Creek Trail and on to familiar territory: the Blackbird Knob Trail continues straight, dropping to the crossing over Red Creek again. 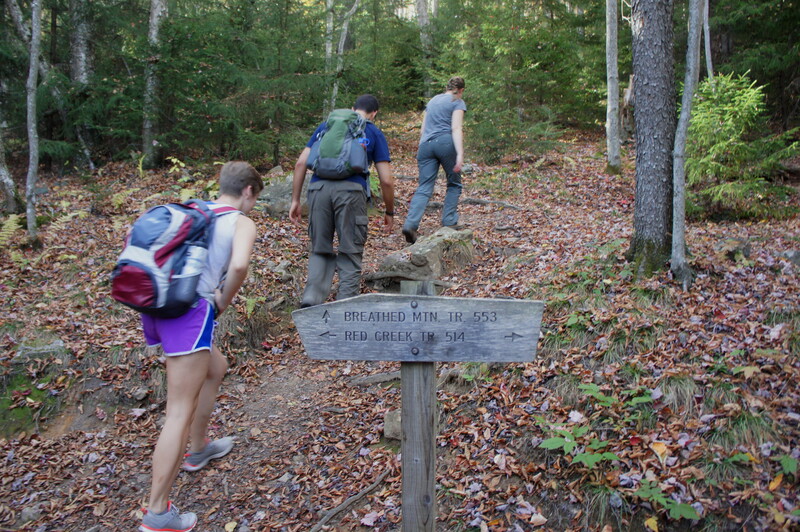 From the stream, it’s 1.7 miles—through meadows, bogs, and spruce and deciduous forests—back to the trailhead. The stem-and-loop is 11.3 miles in all, worthy of a 2-day backpack. For those looking for varied terrain and ecological diversity at Dolly Sods, the Blackbird Knob Loop has virtually no equal. 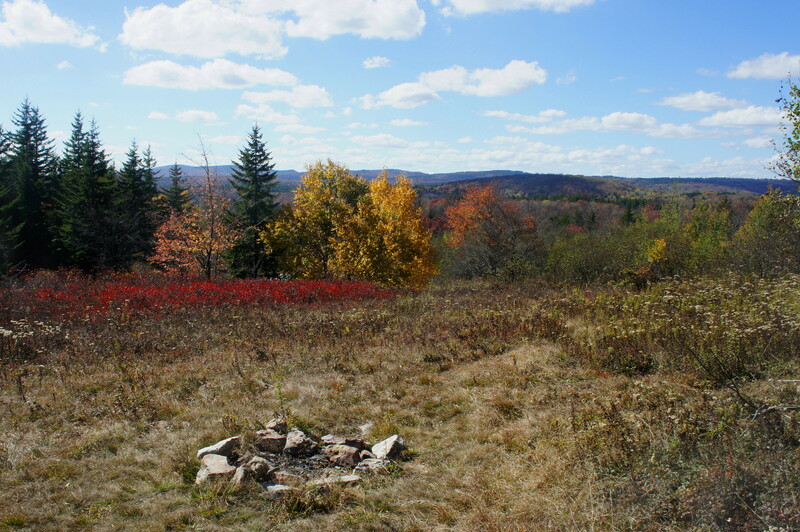 Try the 10.6-mile Dolly Sods North Loop hike, which features excellent views of Canaan Valley from Rocky Ridge, as well as rolling meadows much larger than those encountered on the Blackbird Knob hike. 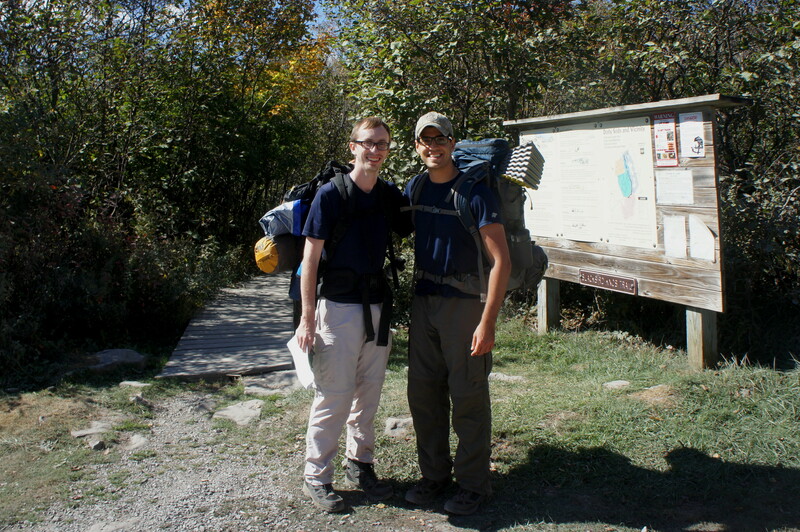 This entry was posted in Dolly Sods Wilderness, Moderate Hikes, Monongahela National Forest, West Virginia and tagged Alder Run, Blackbird Knob, Blackbird Knob Trail, Breathed Mountain Trail, Canaan Valley, Dolly Sods, Harman Trail, meadow, Monongahela National Forest, Red Creek, Red Creek Trail, Rocky Ridge Trail, West Virginia. Bookmark the permalink.